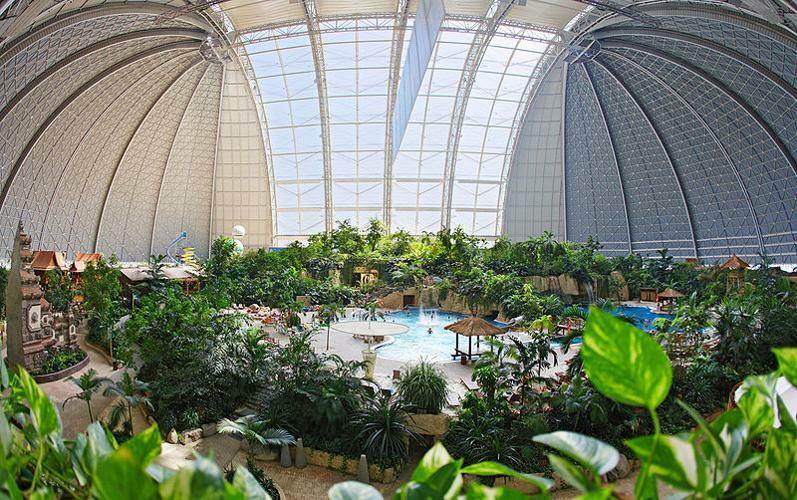 This supermassive hangar once housed gigantic airships, and now it has been given a second life as an indoor tropical resort that holds the world's largest indoor pool and water park. 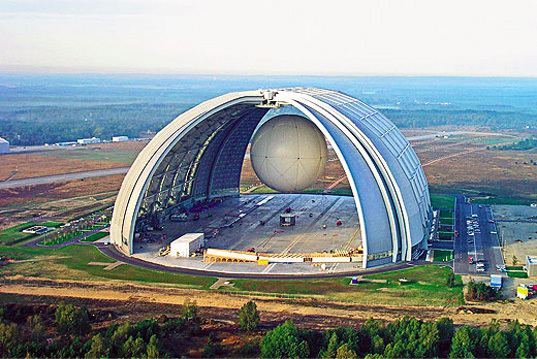 Located in the countryside between Dresden and Berlin, the building was modified to bring in lots of sunlight and the huge doors were welded shut to keep in the heat -- even during the snowy German winter. Inside, a small oceanside village gives visitors a tropical escape. The dome is the world’s largest freestanding building, and it was originally owned by a company attempting to develop a transport dirigible. When that company went belly-up, a Malaysian company took the reins and created a year-round tropical paradise that maintains a lovely 79 degree Fahrenheit. If you like big numbers, this project has some jaw droppers — the roof is 70,000 square meters, the indoor pool is the size of four Olympic sized pools, and the interior holds 5 million cubic feet of space. The building’s south side was stripped of its steel skin and replaced with a transparent film to let daylight in. A small tropical forest of 50,00 trees makes up one side complete with a 9 story tall water slide, fake villages, and even a mock shoreline that makes Las Vegas look modest. This is a spectacular reuse of a unique building for a novel purpose in the heart of Europe, and we love the imagination it took. However we’re critical of the impact of plopping a tropical jungle in a place that will not see above freezing temperatures for weeks — there’s enough snow right now that you could ski home after you get your beach tan. Can somebody tell me if this building has gone through a life cycle assessment and how environmental it truly is? Thanks. it's from Burle Marx's office ! Such a great project ! Such a pity. It would have been far better for the environment had Cargolifter not gone bellyup. Balance the energy use of this against that of Germans flying to tropical locales for a break from winter. This will be of great benefit to health, mental and physical, as long as they don't use too much chlorine in the pool. If they insulated the other walls, the sunlight might be enough to do a lot of the heating for them, leaving less to spend money & energy on to make up the difference. They could also eventually install solar heating outside and really make this green escape green! The dome is the world's largest freestanding building, and it was originally owned by a company attempting to develop a transport dirigible. When that company went belly-up, a Malaysian company took the reins and created a year-round tropical paradise that maintains a lovely 79 degree Fahrenheit. If you like big numbers, this project has some jaw droppers -- the roof is 70,000 square meters, the indoor pool is the size of four Olympic sized pools, and the interior holds 5 million cubic feet of space. The building’s south side was stripped of its steel skin and replaced with a transparent film to let daylight in. A small tropical forest of 50,00 trees makes up one side complete with a 9 story tall water slide, fake villages, and even a mock shoreline that makes Las Vegas look modest. This is a spectacular reuse of a unique building for a novel purpose in the heart of Europe, and we love the imagination it took. However we're critical of the impact of plopping a tropical jungle in a place that will not see above freezing temperatures for weeks -- there's enough snow right now that you could ski home after you get your beach tan.